“Pray then like this: ‘Our Father in heaven, hallowed be your name. Your kingdom come, your will be done, on earth as it is in heaven’” (Matt. 6:9–10). Most of us probably associate holiness with righteousness, this is entirely understandable. The men and women who are deemed holy in Scripture are indeed also renowned for their ethical purity, despite their lack of moral perfection. Yet while this goodness is part of holiness, it is not the primary emphasis of the term. 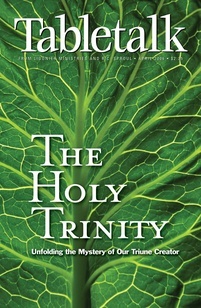 When we read about the holy in the Bible, the primary idea is that which is set apart, unique, or different. In 1 Chronicles 23:13 we read of Aaron being “set apart” or made unique in his capacity to offer sacrifices for the people of God. This quality of uncommonness or uniqueness can apply to people, objects, or time. The ground, for example, upon which Moses encountered the Almighty in the burning bush was holy ground (Ex. 3:1–6). The part of the tabernacle containing the ark of the covenant is the holiest place (Lev. 16:1–2), and the old covenant festivals represent holy time (23). All of these earthly examples are holy because they are set apart by the Lord who is the most “different” or “other” person in the universe. Scripture communicates this idea in speaking of God’s transcendence. Our Creator is high and exalted (Isa. 33:5), above all things and unmatched in His power, glory, and purity (Ex. 15:11). This is also evident in the Ten Commandments and the first portion of the Lord’s prayer. Without special revelation, we might develop a law that forbids murder, but would we make it illegal to profane the name of God (Ex. 20:7)? Even though we have been taught to pray in light of God’s holiness, how many of us pray regularly for the world to mark our Father’s name as holy (Matt. 6:9)? The biblical writers recognize that the way in which we speak God’s name reveals how we think about Him, and so they are careful to warn us to regard His name, and thus His being, as holy. How do you feel when the name of the Lord is taken in vain? Do you shudder in fear for those who do so, or has this common sacrilege become unnoticeable to you? Perhaps you are guilty of profaning His name in speech or in how you come before Him in worship? Consider how you may have taken God’s name in vain recently. Pray that you would not blaspheme Him and encourage your friends to revere His glorious name in thought, word, and deed.